When creating email templates in Stripo, you do not need to worry about their compatibility. 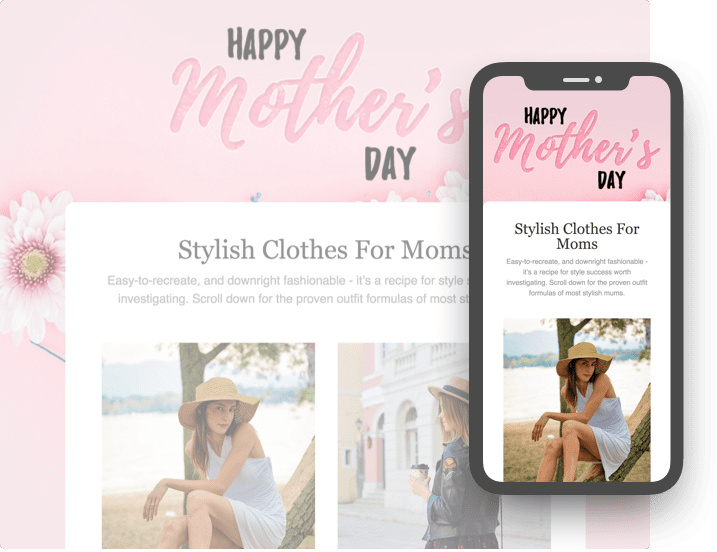 All email templates designed in Stripo HTML email editor become responsive on mobile by default. In case you need advanced customization, we have developed a set of tools to let you easily change the appearance on mobile point-by-point without any fuss. Sync your Email Service Provider platform to get created emails automatically or download pure HTML code. To let you export emails with one click, Stripo email template generator is integrated with the most popular ESPs*, like Mailchimp, Campaign Monitor, Constant Contact, Mailigen, Braze, GetResponse, SendGrid, eSputnik, SendPulse, GMail. Additionally, you will have the option to download your email template as an HTML file, archive or OFT file for sending emails through Outlook. Create new modules with a unique design and adaptability. 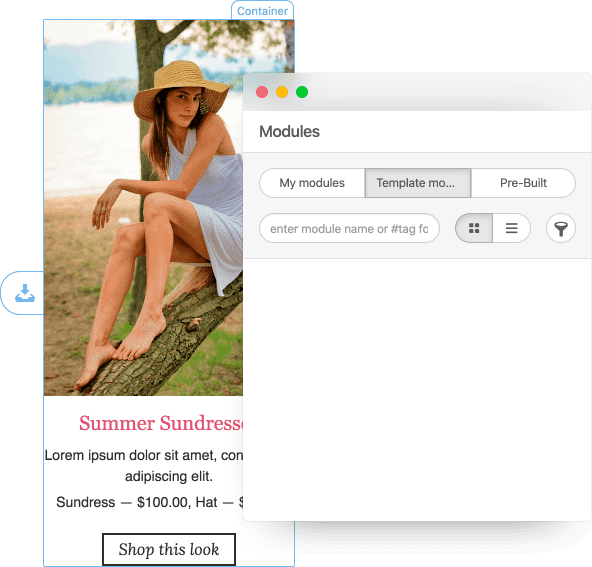 Reduce repeated operations by saving customized Drag-n-Drop modules (based on your own code) to your own Library with the ability to re-use them later in the future email campaigns. Create banners, search for and apply free stock images, edit HTML & CSS code or adjust images in one user-friendly tool. 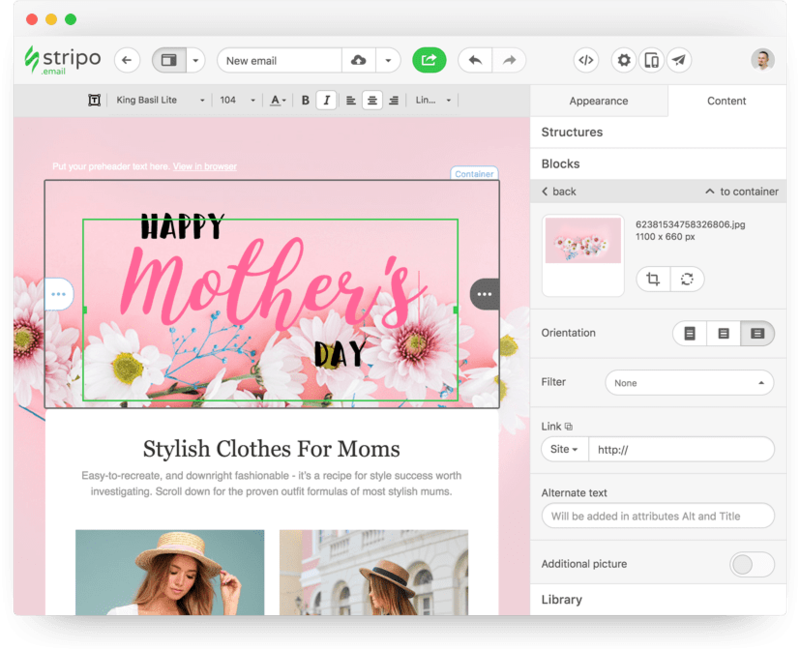 Stripo has integrated assets such as Pixie Image Editor, banner generator, a collection of free stock images, a handy HTML and CSS editor to let you create HTML email templates faster and with great interest. Reduce the time for creating similar day-to-day emails. 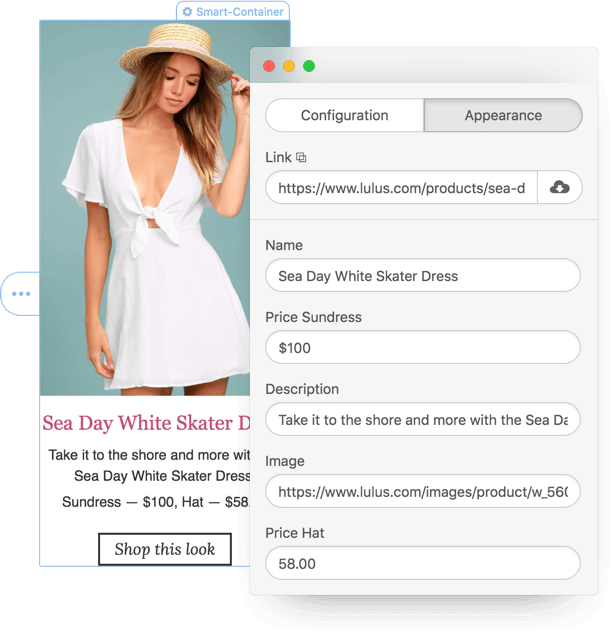 Generate product cards and other modules automatically by specifying a link to the content or fully automate email creation process by using Stripo API. Just pick any of cool templates, change the content and your email is ready to be sent! Start with Forever FREE subscription to check market standard features. Upgrade your capabilities with higher-featured subscriptions. Great for personal use by beginners, small businesses, marketers, designers, others who prefer working alone. Ideal for freelancers, professional teams, agencies. Popular among SAAS companies, inhouse services, and start-ups, who want to get a powerful email editor on a board. Support via chat, phone, and email. Embed Stripo builder into SaaS! Boost your application with drag-n-drop email editor enabling your customer to create beautiful responsive emails fast! Save your money and time on development. Keeping assets on own servers. We look forward to showing you how our editor allows creating beautiful emails fast and simply as the process is similar to a game. Fill out the form and one of our Stripo experts will give you a spin of our product. A Q&A with one of our Stripo tour guides. Someone of our sales team will contact you shortly. In the meantime, check out our Blog Page for tips to take your email designer skills to the next level. Release notes and plans are posted on the site. Email templates building without HTML skills. We constantly develop Stripo HTML email builder. Every day we extend the product with new functionality and keep it stable and consistent according to your needs. Stay up-to-date with current marketing trends, learn the tricks of creating highly conversational emails and be inspired by examples of successful campaigns.